Welcome to Release Notes! This is where we highlight recent product improvements, new features, and things we did on our end to make things on your end even better. I wanted to share what we worked on back in December (lots of exciting updates!). These awesome new features are going to take you through the coming year. Just in time for your New Year’s Resolutions, the month of December in Jungle Scout land got you ready to tackle those big goals. We added more international marketplaces to the extension, and added our first round of international marketplaces to the web app. Always looking for ways to share knowledge and information with the community, we published 4 awesome and informative videos, to help you on your journey as an Amazon seller. Finally, if you missed it there was also a data-driven research study, where we finalized our thoughts on the after effects of the Amazon TOS changes back in October. Let’s take a look at these updates in more detail. Now, when you use the extension, you can get data from even more stores, for no extra cost. That’s right! You heard me. We added even more stores including our top of the line sales equations, specific for each store at no extra cost to you. After months of research and following products, we came up with some killer sales algorithms to help you make sense of those international marketplaces. Ditch your old rules of thumb; taking the US equations and dividing by 2, 3, 5, or whatever you were doing. Now you can rely on us and our sales equations, knowing that we feel just as confident about these new algorithms as we do our US equations. We are the only product on the market that has taken the time to compile these for you, so take advantage of this new information and launch your business internationally! We are incredibly excited about this, and our data scientist has even more ideas in the making. So where can you use the extension now? The US, UK, Canada, Mexico, Spain, Italy, France, Germany and India! Just like the extension, we wanted to bring this new information to the web app. Using the same prized algorithms I mentioned above, you can now browse more stores in the web app. Each store was designed with its own parent categories, relative to their marketplace. And each store displays prices in its own currency and metrics. These metrics are made, from head to toe, with the marketplace and ease for seller to identify products in mind. 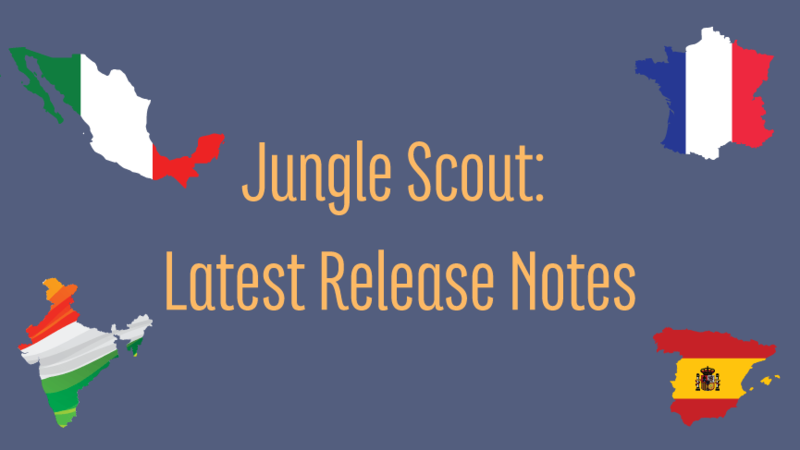 We dove into them deeper in the New Stores Added to the Jungle Scout Web App post, if you want to understand more. Oh! And Greg also wrote the blog 3 Ways That International Research Can Uncover Amazon Opportunities to get your juices flowing on selling in those international marketplaces. Check it out! So where can you use the web app? The US, UK, Canada, Mexico, Spain, Italy, France, Germany and India! Our video expert, Lenny, was hard at work in December, adding videos to help you when it comes to hijackers, seller hacks, and product photography. He even gives you some tips for what we think is in store for sellers in 2017, along with our New Year’s Promotion. Spoiler alert! We have a new case study in the making! Check out the videos for more details. In October, Amazon made some huge changes that affected all sellers. So, we wanted to take a look at real data and understand what this really meant for sellers. We studied almost 6k products and took a look at metrics before and after the TOS change. What did we learn? Products lost a median of 28 reviews, or 41% of their total reviews. No specific categories were targeted for review removal, and the removals affected the products by decreasing their star rating by an average of .13. You can read more about the fallout in our incentivized reviews article. It outlines the specifics of our findings. What happens moving forward? Having a solid product, with a high-calibre listing and outstanding photography, is more important than ever. Customers feel they can truly rely on reviews again and will ultimately help your product, assuming its quality is top notch. Panicking is so 2016; now it’s time to get to work! Overall it was a big month and year, but it’s nothing compared to what we have in store for 2017. Stay tuned! You have seen us expand our suite of tools in 2016: launching Review Kick, now re-branded as Jump Send; joining forces with the guys at Splitly, to make split testing easier for you; and, at the end of the year, releasing Fetcher to ease your profitability worries. We would love to hear about what you are excited for in 2017. A few random participants will even get some sweet swag, our love and our eternal gratitude (well. you already have that, but we will tell you again!). Click below to tell us how we can make your lives a bit easier! Can I use it in Japan? If not ,do you have any plans to release for Japanese market. I would like to know whether chrome extension of Jungle scout works in India..Please let me know ..